Winter at Le Chatox puts you less than half an hour from 5 yes FIVE brilliant local resorts. This is us skiing at February half term away from the crowds at Margeriaz where skiing is amazingly good value for money. Less than half the big resorts and less crowded. Here’s a gentle Blue run at Margeriaz which suits skiers of all levels…. Skiing in Les Bauges provides ‘real skiing’ with local people. Aillons-Margeriaz is only 20 mins drive from Le Chatox. Le Feclaz/Revard 30 mins. 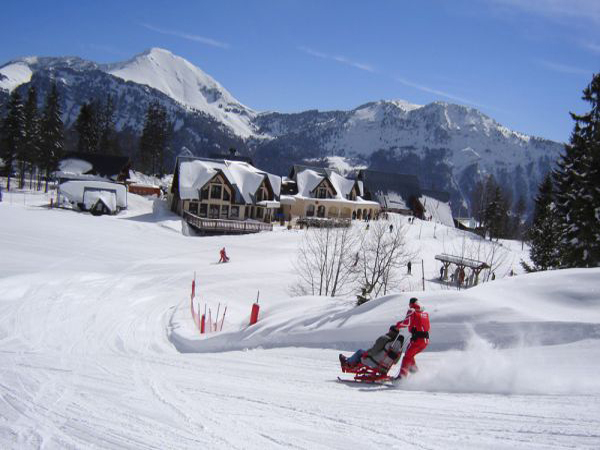 The ski resort is a hidden gem frequented by the French in the know and has enough slopes to suit skiers, snow shoers of all abilities and a snow park. 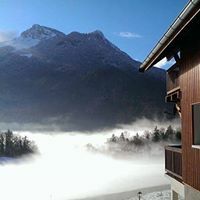 It is perfect for beginners and brilliant for intermediates and families with small children who might not want to spend a whole week skiing but prefer to mix it up with visits to Annecy, Aix-Les-Bains or Chambery. You will be staggered at comparisons to the big resorts in prices where you pay 240 euro per week for a lift pass and may only cover 10% of the area in a week. Lift passes in Les Bauges are only 120 euro for a week! Kids rates go to 18 years not 12 as in the larger resorts and are only 94 euro. Day rates are 15-23 euro. We have a great agent for discounts on equipment hire at Skimium approx 50 euro for ski’s and boots! For this reason, Le Chatox is a great base to try skiing for the first time and get real value for money. Its also very quiet with no crowds. Situated between the lac d’Annecy to the north and Chambery to the South, the Bauges Massif is often ignored as skiers head to the large Savoie resorts. Interestingly, because of its location, Les Bauges often gets the first snow of the season. Skiing in Les Bauges provides ‘real skiing’ with local people. Aillons-Margeriaz, 1000 – 1950m, is approx 20 mins drive from Le Chatox. There are two resorts here just 3 miles apart. Les Aillons and Margeriaz. The ski resort is a hidden gem frequented by the French in the know and has enough slopes to suit skiers of all abilities with 35 ski lifts and a snow park. Chatox early morn… then up to Margeriaz for a ski…..
Whilst apline skiing is what most Brits want to do, the locals are just as happy, as we now are, with ski randonee – walking in snow shoes or ski’s. 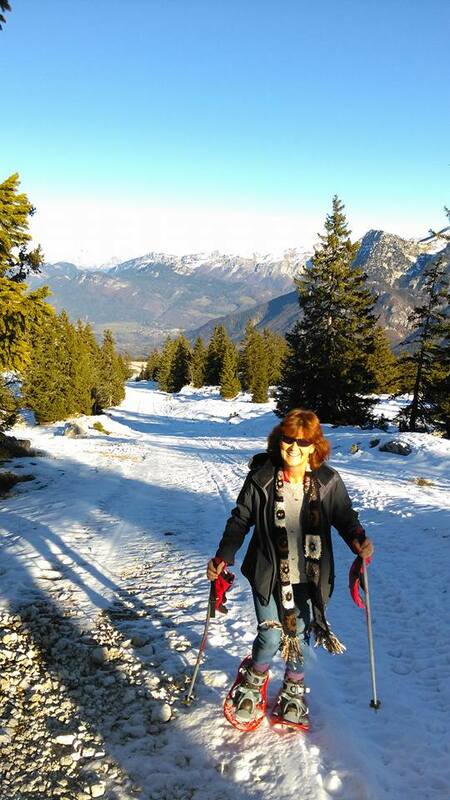 You picnic at the top and walk or ski back – (just a little wine perhaps! No lift passes or people. You can book guided treks or ask our neighbours who took us out pictured below. Wendy is fourth in line. The picnic at the top was sensational as was the ski run or walk back down. Up and out for a ski trek the old way, you walk up, ski down ! At Aillons-Margeriaz you can not only learn how to ski with expert tuition from ESF, you can find enough piste to keep you content for your stay and at less than half the price of the big resorts. For those of you who are non-skiers or just want to try something different, Les Aillons offers Husky dogsled rides or ski du fond (cross country aka Nordique skiing) which is great fun and a fantastic workout. ….feel the thrill of being pulled by huskys ! only for the summer, but if you fancy something other than skiing you can check out the family things to do here http://www.lesbauges.com/famille.html. Another nearby resort with amazing views over the Lac du Bourget, is Le Revard, La Féclaz and St. François de Sales together known as the Grand Revard 1350m – 1500m, just 30 mins from Le Chatox. It is also known as “Little Canada” primarily because it resembles the vast winter tundra of the Canadian west: miles of rolling sunlight clearings and thick evergreen forests. Although situated in the mountains, the whole ski range is on a high-plateau, thus allowing for miles and miles of endless Nordic skiing. In fact, the resort reputes itself as being the number one French destination for Cross-Country skiing (140km) with Alpine sking (50km) and snowpark activities as secondary attractions. 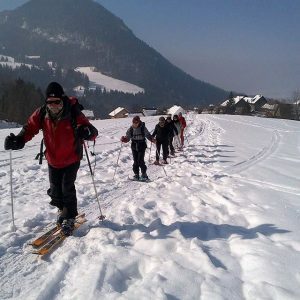 But if the skiing isn’t enough for you, there are snowshoeing, dog-sled rides, tobogganing, snowscooting and an old form of Savoyard sledding called yonner. Other more popular and higher “snow sure” ski resorts such as Courcheval, Meribel and our favourite, Val Thorens are within easy reach for a days skiing (approx 1hr drive). Annecy – the Venice of the Alps. A must if you visit, even in winter. 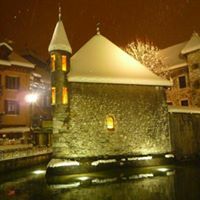 If you want an afternoon away from the slopes, why not head to the beautiful town of Annecy for lunch followed by a walk around the old town or perhaps venture over to the west side of the lake with its numerous Michelin 3 star restaurants! For another excursion there is the spa town Aix les Bains and the Lac du Bourget for its mountain views and thermal baths. There are hire shops at Les Aillons Station, Margeriaz & La Feclaz. To make a big saving we recommend booking in advance online at Skimium for the best deal and collect at Aillons Sport. It is also worth keeping your ski pass from Aillons-Margeriaz as you get a refund on your next pass if you ski outside school holidays! Likewise, if you just pay on a daily basis there is a discount if you already have your pass.